A dessert you don’t have to turn you oven on for. Perfect for backyard BBQ’s. You don’t have to leave the party and everyone will enjoy a hot off the grill dessert! 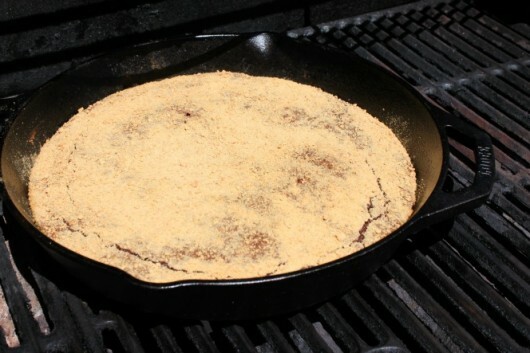 Place brownie mix into greased skillet and top with graham cracker crumbs. 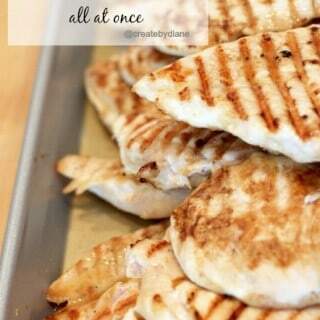 Bake it on the grill! No heating up the house with the oven with this one. 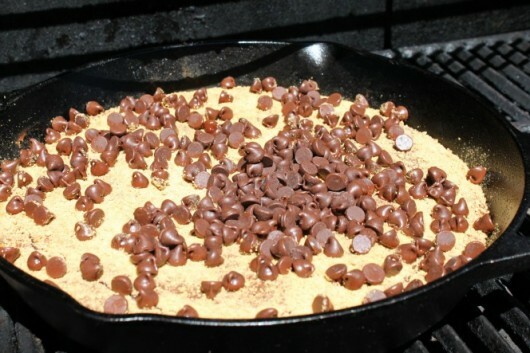 Place chocolate chips on top of graham cracker crumbs after it’s mostly baked. 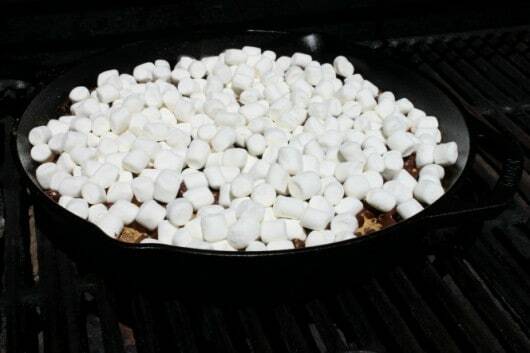 Then top it off with marshmallows. Leave enough room for them to swell. 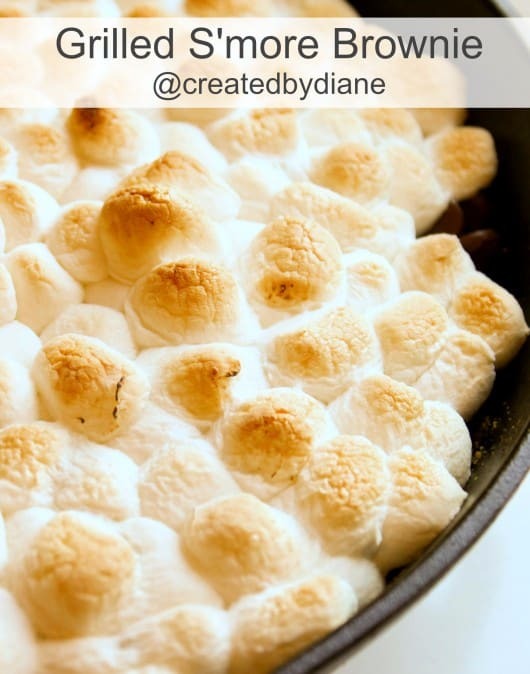 Marshmallows get nice and puffy when they are heated. Remove from grill when marshmallows are toasted,. Scoop out and serve warm. Heat Grill to 325 degrees. Oil 12" Cast iron skillet. Prepare brownie mix according to package directions. Pour mix into cast iron skillet. 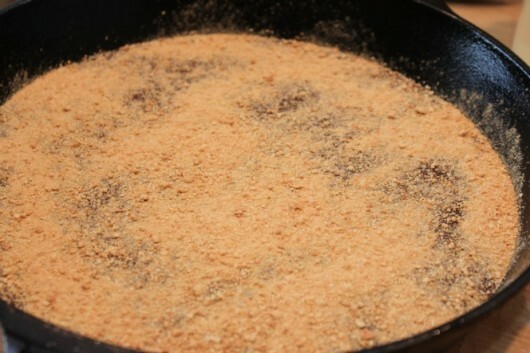 Place graham cracker crumbs on top of brownie mix. Place skillet on grill and cook for 25-35 minutes at 300-325 degrees. 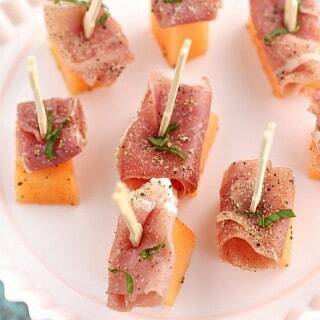 Test with tooth pick, don't over cook, but make sure it's at more than ½ way cooked. Place chocolate chips on top, spread with offset spatula to coat brownie evenly. 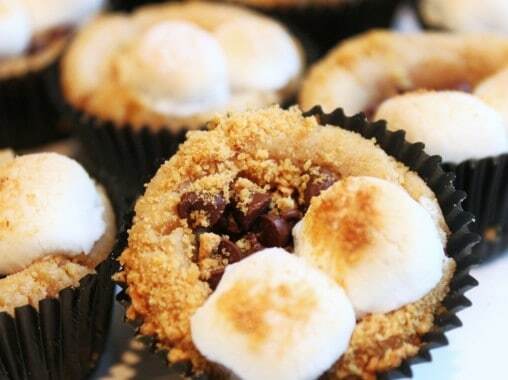 Place mini marshmallows on top, be sure not to overcrowd them, they will swell and puff up when heated. 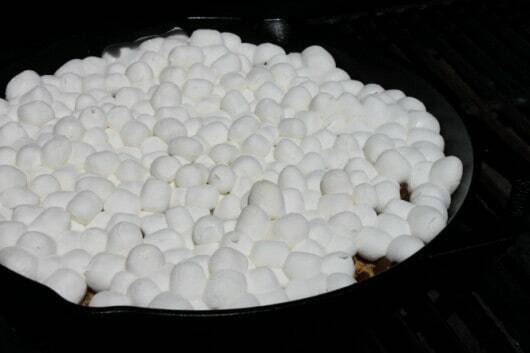 Place skillet back on grill for until marshmallows are lightly brown about 3-5 minutes. 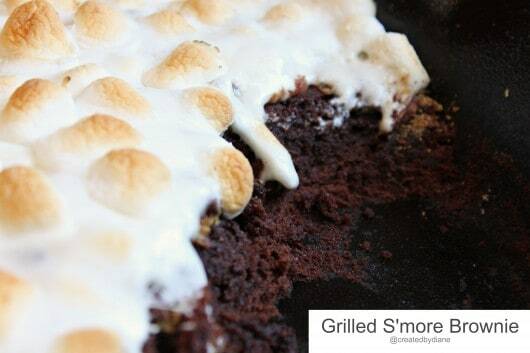 The skillet will stay hot so the brownie will continue to cook. 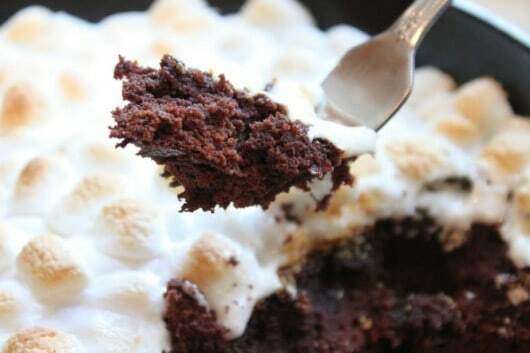 Place knife along edge to test brownie without disturbing marshmallows. This is best served, very warm. Don't try to cut it into pieces, the marshmallows will pull off the top. Scoop out with large serving spoon, scoop out the serving and remove from serving spoon with another spoon or knife. *note- be sure temperature of grill isn’t too hot, like an oven it will burn an become dry. Try an oven thermometer if you grill doesn’t have a thermometer. I could see this with some with a big scoop of ice cream too, can’t you? This is awesome, Diane!!! I just printed it to make this weekend. My kids are going to love this!! Love! This looks great Diane-added plus that you can make it outside. Sorry about that I just added the skillet size. I used a 12″ skillet. If yours is smaller, just test for doneness. I have no idea how to check the temp of my grill….I have a gas one…do I just put it on high and do a toothpick test like in the oven? My grill has a thermostat, if yours doesn’t; I’d preheat it like you do an oven, then turn it to medium heat to cook it and yes test with toothpick. Its ok if it’s moist in center but set up, it will cook more when you add toppings and when cooling slightly before serving. I’m not sure if an oven temperature gauge will work on a grill but I’m guessing it will, they are about $3 at walmart, that is also another option. Thank you so much for replying! Thanks…I never thought of that. I will go get one this weekend and try this!! I can’t wait. I will let you know how it goes. Oh my goodness. This is the best thing ever! What a fun brownie for a party! So FUN! Love dishes made in skillets on the grill!! LOVE this one dish brownie!! So fun!! Honestly, Diane this is brilliant! YUM. what a fantastic idea! I love the graham crust layer. Perfect grilled dessert! 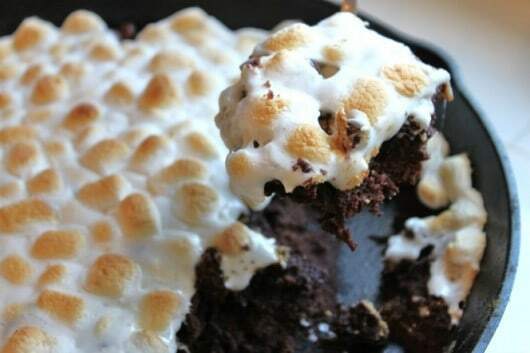 Looks like heaven in brownie form….A must make. Oh my goodness, YUM! Why didn’t I see this sooner!? I could have made it for dessert tonight when I had family over. Bummer! Next time for sure! Could I do this in my oven? oh my goodness, this looks DIVINE!! 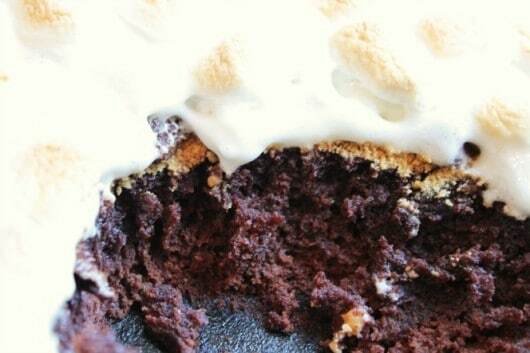 Oh my gosh, I have only ever had smores one time in my life, but in a brownie form?? Never. this looks too good to be true! 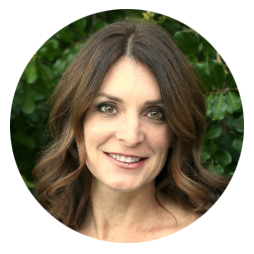 Can you be my mom? Just kidding, I’m 25 and I love my mom. But jeeeez this makes me wish I was still of the age when I could eat this whole thing by myself and not feel like a million pounds. 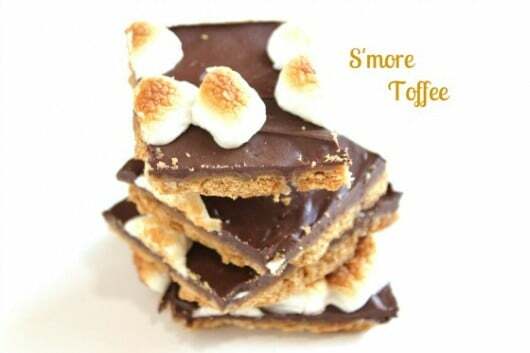 I will definitely have to make this someday, it’s like all of my favorite snacks in one. Kudos! i can’t even begin to say just how delicious this looks! LOVE it! It looks great! I love it! This. Is. Pure. Genius. Can I just eat this right now, through the screen? Your photos are amazing! And I like the fact that it’s fairly simple and easy to do. I’ll definitely be back on your blog to steal more yummy ideas/recipes. 🙂 Thanks for sharing! What a fabulous idea! Love it! Oh dear gracious! I think it’s time for me to become the best aunt ever! 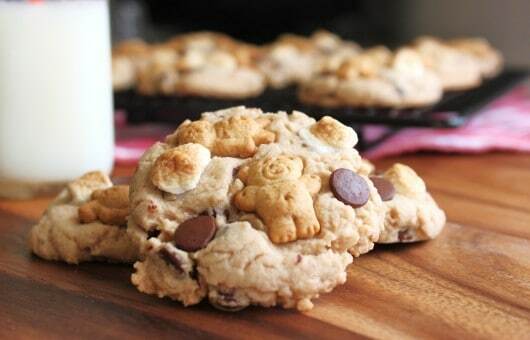 I’m making this first thing tomorrow afternoon for all 14 nieces and nephews while they’re visiting. 2 for them to share, and one for the hard working aunt! ;D thanks so so so much for the recipe! 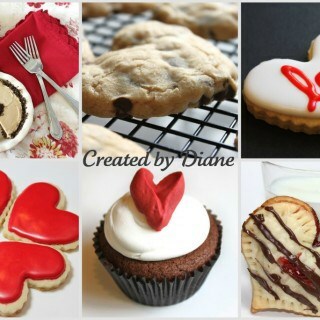 Wow…it looks so amazingly good in pictures and I’m sure they taste that good as well. 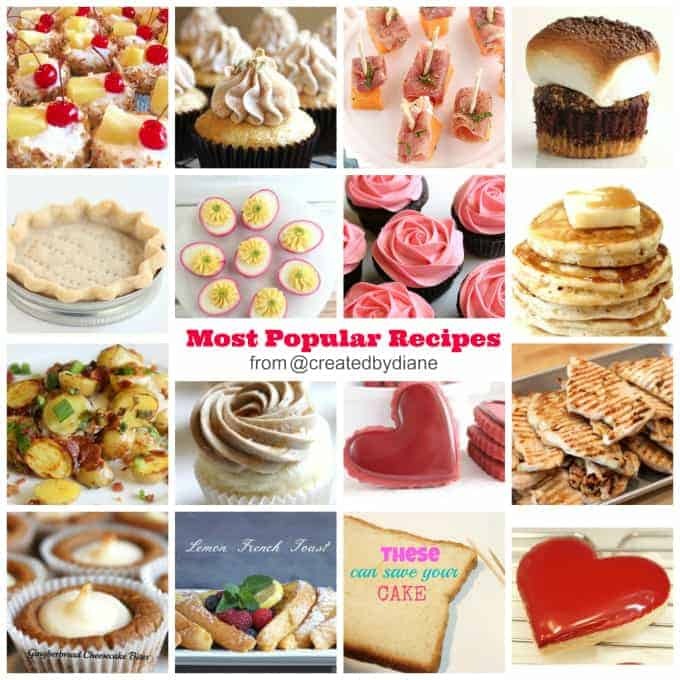 I like recipes (like the one you shared above) that are simple to make and are yet innovative and interesting. 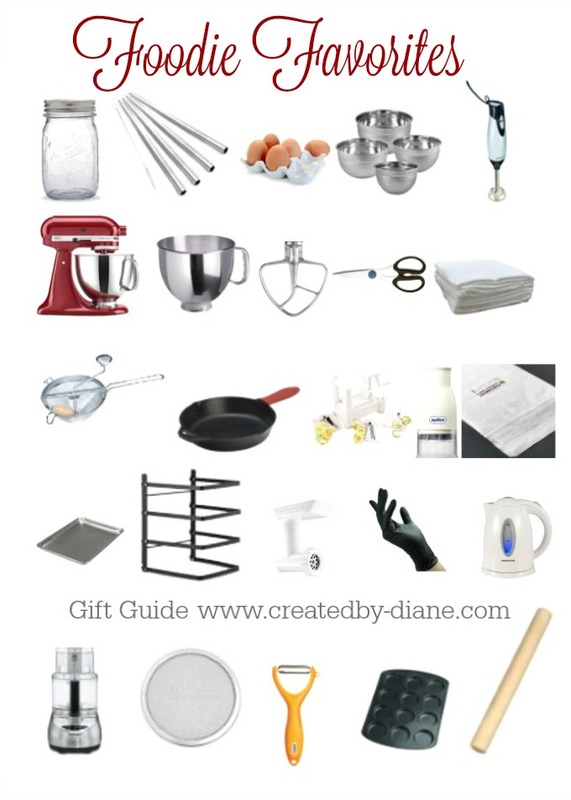 I usually prefer desserts and a snack that is pre-done and only need to go into the oven so I don’t miss out on the fun and chit chat while being busy cooking. So I liked it even more when I read that I won’t have to leave the party and everyone will enjoy a hot off the grill dessert! I shall try this in the next get-together at my place. Thanks for sharing the recipe. I’m sold. 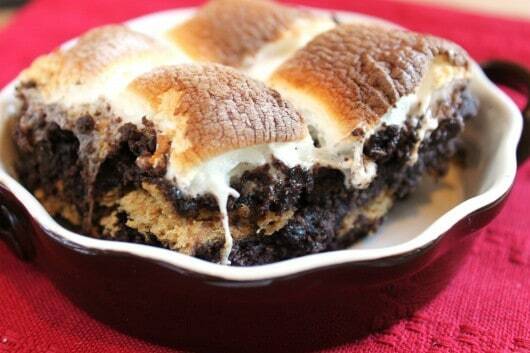 Will be making this dessert soon! I did make this dessert. It didn’t come out as well as I hoped, but I did not know the temperature of the grill and didn’t keep a close eye on it. The bottom of the brownies burned, while the middle was still not done. In the end, it was edible, but I need to try it again to do it right. I might just do it in the oven next time. I wonder if it would also work well in a dutch oven over coals? This dessert has lots of potential. Allison, try an oven thermometer on the grill to keep track of the temperature, that should help. Like an oven if it gets too hot, it will dry out and burn. It will work in the oven if you prefer that option. I haven’t cooked in a dutch oven over coals but I’m sure it will work you’ll just have to keep an eye on it. Hope it works out better for you next time. 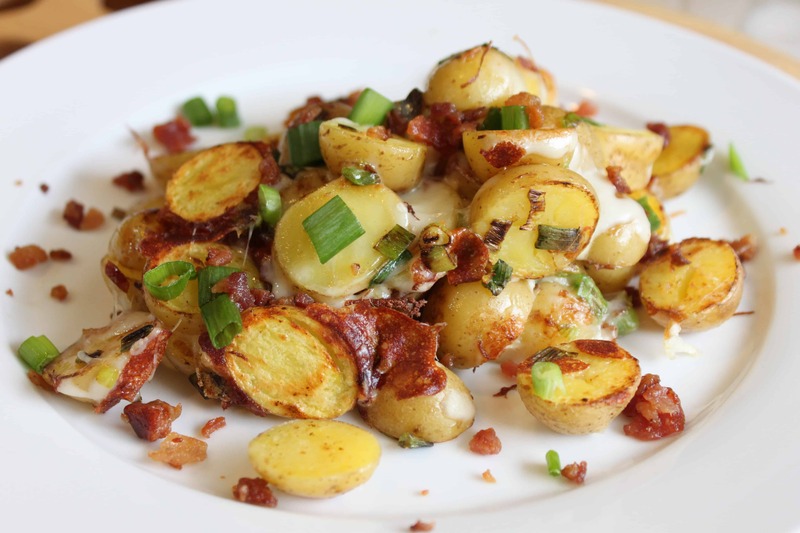 I did this recipe on my oven, and it did work, taste delicious! Mind blowing. 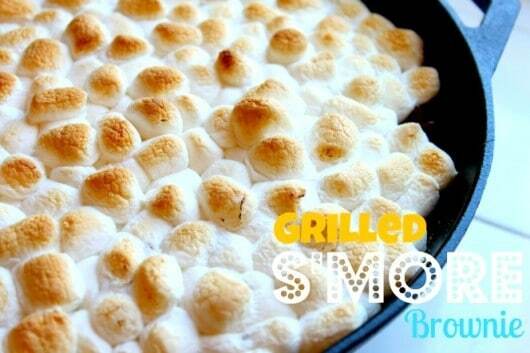 Loved that smokey texture on the marshmallows. It looks gr8. Great idea! I’ll try your recipe…thanks for sharing! I would bring a lid, or a thin aluminum pie plate and use it for a lid, that will help trap in some of the heat and ensure it bakes up evenly. It will also help melt the marshmallows. What a great idea! Looks so good and sounds so easy. Though its quite simple recipe, my 10 yr child is crazy about it. Looks amazing. Do you need to use indirect heat or straight over the fire is ok? I used a gas grill and the cast iron pan was over the flame, no touching but directly on top, I’m sure as long as the grill is hot enough it’ll cook it!